Letter from Pauline Pauling to LP which describes the diabetic condition of her son Michael. She states the doses of insulin that he is taking every day, which have been changed in an effort to keep his blood sugar down. She states that she needs to feed him better. I would like to have powder photographs prepared of certain alloys of silver and gold with beryllium. Could you have small samples of these alloys made, presumably by Mr. Bergman? 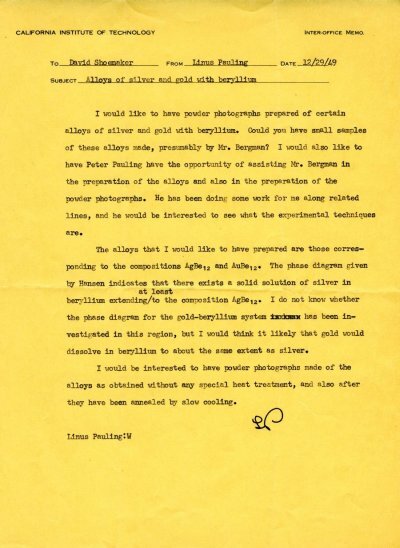 I would also like to have Peter Pauling have the opportunity of assisting Mr. Bergman in the preparation of the alloys and also in the preparation of the powder photographs. He has been doing some work for me along related lines, and he would be interested to see what the experimental techniques are. The alloys that I would like to have prepared are those corresponding to the compositions AgBe12 and AuBe12. The phase diagram given by Hansen indicates that there exists a solid solution of silver in beryllium extending at least to the composition AgBe12. I do not know whether the phase diagram for the gold-beryllium system has been investigated in this region, but I would think it likely that gold would dissolve in beryllium to about the same extent as silver. I would be interested to have powder photographs made of the alloys as obtained without any special heat treatment, and also after they have been annealed by slow cooling.